We at Health P.O. decided to increase awareness about fruits & veggies around us by understanding their nutritional and health benefits one fruit/veggie at a time! Hence our new weekly section - Fruit/Vegetable of the Week which covers various aspects of the selected fruit/vegetable from origin to health benefits to recipes. We kick start this new introduction with a highly underrated fruit - PAPAYA! The exact origination of papaya is unknown but it is believed to be native to southern Mexico and neighboring Central America. The papaya is a melon like fruit with yellow-orange flesh enclosed in a thin skin that varies in color from green to orange to rose. Papayas are a good source of vitamin A and C.
Look for papayas that are partly or completely yellow in color, depending on variety, that give slightly to pressure, but are not soft at the stem-end. Avoid papayas that are bruised, shriveled, or have soft areas. Papayas that are hard and green are immature and will not ripen properly. Uncut papayas have no smell. Papayas that are cut should smell sweet, not bad or fermented. Slightly green papayas will ripen quickly at room temperature, especially if placed in a paper bag. As the papaya ripens, it will turn from green to yellow. Place ripe papayas in a plastic bag and store in the refrigerator. Papayas will keep for up to a week, but it's best to use them within a day or two. Papaya is a fruit high in fiber which lowers cholesterol levels. Papaya contains antioxidants which prevents the cholesterol from oxidizing. When cholesterol in the body gets oxidized, it can lead to heart-attacks. The anti-oxidants in papaya also help in controlling premature ageing, which helps to give a young look. - Papaya contains a high amount of potassium and the flesh of papaya is very high in Vitamin A. - Papaya seeds and leaves are useful in treating intestinal worms found in the body. - Papaya helps prevent constipation and also aid in digestion. Papaya contains the protein called papain which is a digestive enzyme that helps in natural digestion process. - Papaya juice helps in alleviating infections of the colon by clearing away the infection, pus and mucus. Regular consumption will help in improving the problem. - The skin of papaya is excellent for treating skin wounds and places that do not heal quickly. - Papaya is low in calories and high in nutritive value hence it is an excellent food for those on a diet. - Regularly consuming papaya helps to relieve morning sickness and nausea. - Papaya has anti-inflammatory properties and anti-cancerous properties. The anti-inflammatory properties in papaya will help reduce pain for those suffering from arthritis, edema and osteoporosis. - Papaya is very good for those who frequently suffer from cold, cough or flu because intake of papaya boosts the immune system. The high concentration of Vitamin C and Vitamin A contained in papaya is very beneficial to strengthen the immune system. - Papaya is also very good for the hair and helps in controlling dandruff. Papaya shampoos are good for the hair and are available in many health stores. - Raw papaya also helps in reducing menstrual irregularities for women. Papaya helps to ease the condition by promoting natural flow of menstruation. - Papaya cleans the stomach and studies have shown that papaya alone eaten for 3 to 4 days has a highly beneficial tonic effect upon the stomach and intestines. 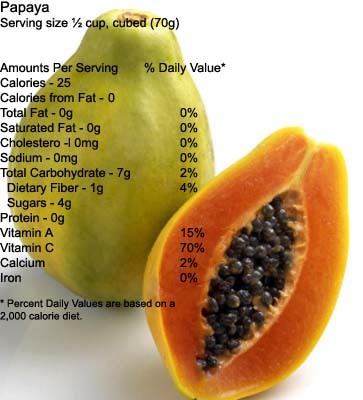 All the parts of the papaya fruit are useful and beneficial. Right from the seeds to the papaya leaves and the flesh of the fruit, all of it has some value. Both the inside and the outside of the fruit can be utilized .Thus no part of the fruit is useless or goes as a waste. So, go ahead and eat plenty of those papayas! !